Research has shown that lesions in the hippocampus of monkeys results in limited impairment of function, whereas extensive lesions that include the hippocampus and the medial temporal cortex result in severe impairment. Adjacent areas in the superior, posterior, and lateral parts of the temporal lobes are involved in high-level auditory processing. 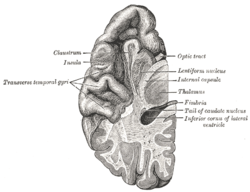 The temporal lobe is involved in primary auditory perception, such as hearing, and holds the primary auditory cortex. The primary auditory cortex receives sensory information from the ears and secondary areas process the information into meaningful units such as speech and words. The superior temporal gyrus includes an area (within the lateral fissure) where auditory signals from the cochlea first reach the cerebral cortex and are processed by the primary auditory cortex in the left temporal lobe. The areas associated with vision in the temporal lobe interpret the meaning of visual stimuli and establish object recognition. The ventral part of the temporal cortices appear to be involved in high-level visual processing of complex stimuli such as faces (fusiform gyrus) and scenes (parahippocampal gyrus). Anterior parts of this ventral stream for visual processing are involved in object perception and recognition. The temporal lobe holds the primary auditory cortex, which is important for the processing of semantics in both speech and vision in humans. Wernicke's area, which spans the region between temporal and parietal lobes, plays a key role (in tandem with Broca's area in the frontal lobe) in speech comprehension. The functions of the left temporal lobe are not limited to low-level perception but extend to comprehension, naming, and verbal memory. Individuals who suffer from medial temporal lobe damage have a difficult time recalling visual stimuli. This neurotransmission deficit is due, not to lacking perception of visual stimuli but, to lacking perception of interpretation. The most common symptom of inferior temporal lobe damage is visual agnosia, which involves impairment in the identification of familiar objects. Another less common type of inferior temporal lobe damage is prosopagnosia which is an impairment in the recognition of faces and distinction of unique individual facial features. Damage specifically to the anterior portion of the left temporal lobe can cause savant syndrome. Pick's disease, also known as frontotemporal amnesia, is caused by atrophy of the frontotemporal lobe. Emotional symptoms include mood changes, which the patient may be unaware of, including poor attention span and aggressive behavior towards themselves and/or others. Language symptoms include loss of speech, inability to read and/or write, loss of vocabulary and overall degeneration of motor ability. Temporal lobe epilepsy is a chronic neurological condition characterized by recurrent seizures; symptoms include a variety of sensory (visual, auditory, olfactory, and gustation) hallucinations, as well as an inability to process semantic and episodic memories. ^ a b c Starr, Philip A.; Barbaro, Nicholas M.; Larson, Paul S. (30 November 2008). Neurosurgical Operative Atlas: Functional Neurosurgery. Thieme. pp. 16, 26. ISBN 9781588903990. ^ Sekhar, Laligam N.; de Oliveira, Evandro (1999). Cranial Microsurgery: Approaches and Techniques. Thieme. p. 432. ISBN 9780865776982. ^ a b c d e f g h Smith; Kosslyn (2007). Cognitive Psychology: Mind and Brain. New Jersey: Prentice Hall. pp. 21, 194–199, 349. ^ Squire, LR; Stark, CE; Clark, RE (2004). "The medial temporal lobe" (PDF). Annual Review of Neuroscience. 27: 279–306. doi:10.1146/annurev.neuro.27.070203.144130. PMID 15217334. ^ Hickok, Gregory; Poeppel, David (May 2007). "The Cortical Organization of Speech Processing". Nature Reviews Neuroscience. 8 (5): 393–402. doi:10.1038/nrn2113. PMID 17431404. Retrieved 24 May 2014. ^ Pertzov, Y., Miller, T. D., Gorgoraptis, N., Caine, D., Schott, J. M., Butler, C., & Husain, M. (2013). Binding deficits in memory following medial temporal lobe damage in patients with voltage-gated potassium channel complex antibody-associated limbic encephalitis. Brain: A Journal of Neurology, 136(8), 2474-2485. ^ Mizuno, T., & Takeda, K. (2009). [The symptomatology of frontal and temporal lobe damages]. Brain And Nerve = Shinkei Kenkyū No Shinpo, 61(11), 1209-1218. ^ Treffert, D. A. (2009). "The savant syndrome: An extraordinary condition. A synopsis: Past, present, future". Philosophical Transactions of the Royal Society B: Biological Sciences. 364 (1522): 1351–7. doi:10.1098/rstb.2008.0326. PMC 2677584. PMID 19528017. ^ Takeda, N.; Kishimoto, Y.; Yokota, O. (2012). "Pick's disease". Advances in Experimental Medicine and Biology. 724: 300–316. doi:10.1007/978-1-4614-0653-2_23. ^ Yokota, O.; Tsuchiya, K.; Arai, T.; Yagishita, S.; Matsubara, O.; Mochizuki, A.; Akiyama, H. (2009). "Clinicopathological characterization of Pick's disease versus frontotemporal lobar degeneration with ubiquitin/TDP-43-positive inclusions". Acta Neuropathologica. 117 (4): 429–444. doi:10.1007/s00401-009-0493-4. PMID 19194716. ^ Hugdahl K, Løberg E-M, Nygård M. Left Temporal Lobe Structural and Functional Abnormality Underlying Auditory Hallucinations in Schizophrenia. Frontiers in Neuroscience. 2009;3(1):34-45. doi:10.3389/neuro.01.001.2009. ^ Ikuta T, DeRosse P, Argyelan M, et al. Subcortical Modulation in Auditory Processing and Auditory Hallucinations. Behavioural brain research. 2015;295:78-81. doi:10.1016/j.bbr.2015.08.009. 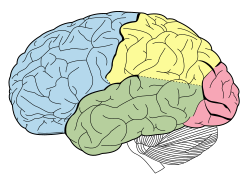 Wikimedia Commons has media related to Temporal lobe.